Who says you can’t teach an old dog new tricks. 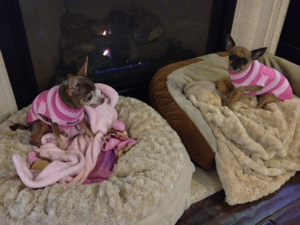 To see Greta, aka, Coco today in her fabulous Newport Beach Townhome, one would never suspect that this sweet senior Chihuahua ever had it rough. Coco was turned into the Baldwin Park animal shelter after being found wandering around an apartment complex. She must have walked for miles because the bottom pads of her paws were torn and bleeding. When we first saw her shelter mug shot with her tongue hanging out the side, we immediately put a hold on her before we had even met her! We rushed over to scoop her out of the scary shelter and held her in a soft blankie the entire way home. We still wonder how Coco got separated from her owner. She appears to have been someones pet – she was already spayed, her coat was downy soft and she appeared to have had teeth extractions previously. Did her owner pass away? Lose their home? Did she get lost? While her past is still a mystery to us, we quickly learned that Coco is quite the diva and certainly has a mind of her own! She knows how to get what she wants and is a very smart little girl. 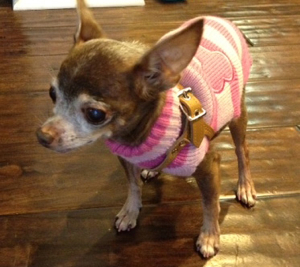 Coco is a 9 year old, 3 pound purebred applehead Chihuahua with no teeth (we had her last two pulled) and bad knees. Some may ask themselves who in the world would want to adopt a dog like Coco but her adoptive parents, Bill and Tammy Walsworth can’t understand who wouldn’t! 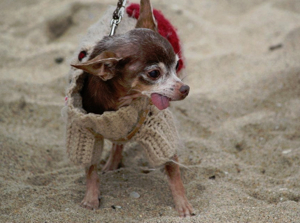 Bill and Tammy have remarked at how easy it was to transition Coco into her new home and integrate her into their daily routine with their other rescued Chihuahua, Tinkerbell. When asked to comment on her adoption, her family replied “A senior pet is the best pet! We did not have to worry about chewing, she was potty trained very quickly, was already the perfect size and had a wonderful personality ideal for our home and lifestyle”, says Tammy. Coco and thousands of dogs like her, just need someone with an open heart and a warm lap to show you the joy their companionship can bring. These sweet discarded and often over-looked senior pets, have hearts as big as lions and nothing but love to share. We hope that Coco’s story has inspired you to consider a senior the next time you adopt.